This post was originally posted in 2011 but I have re-written it as I am trying to keep a record of my views on the shoes I have owned. This update is from June 2013. 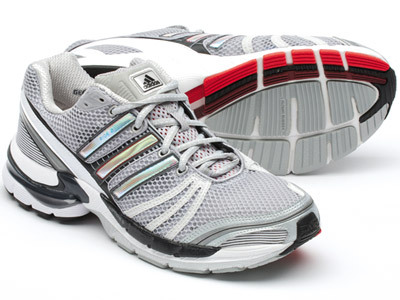 These were the first pair of running shoes I bought (back in 2010 - it's flown by!) after deciding to take up this running lark. During my shopping trip I tried some other brands but the Adidas Ride 2 felt like the most natural fit for me, so without much dithering I happily handed over the dosh and continued with my running journey. I think Adidas are now (June 2013) on version 5 of this shoe, so this post is very outdated. But I wanted to have record of the shoe that helped me towards my first series of races. They weigh in at a whopping 344 grams, not something I had thought about when I first bought them but now when compared against some of my newer acquisitions they seem incredibly heavy. I'm not entirely sure of the exact heel-to-toe drop, but it must be somewhere around the 12mm mark. I have never had any reason to complain about these shoes, they have served me well and if it wasn't for the weight and heel-to-toe drop I'd happily buy another pair. They have lasted very well. After putting 1250km's on them, they still feel very comfortable. I officially retired them last year but every now and I bring them out of retirement for a little nostalgic run. Being my first pair of running shoes, they will always have a special place in my heart. They still feel quite comfortable and I quite often wear them as everyday shoes.